I found a news story (in Dutch) that is reporting bol.com now have an ebook bundle for 99 euros that consists of 10 ebooks and a basic ereader. The ereader isn't named, but the article does say that it has an E-ink screen but not Wifi or a touchscreen. I'm still trying to verify this so please take it with a grain of salt. I can't find any sign of this on Bol.com, but I think there's a very good chance this is true. It's quite possible that Bol.com got a good deal on, for example, the Aluratek Libre. I was expecting to see sales like this as the holidays approach. It wouldn't have been possible last year, but after the ereader price war I though it was almost a certainty. Second Update: He also found the product page. The ereader has a 7" LCD screen, a microSD card slot, and seems like to could be a decent PMP. I can't tell if it actually supports Adobe DRM. It does not have E Ink but a 7″ LCD color screen. 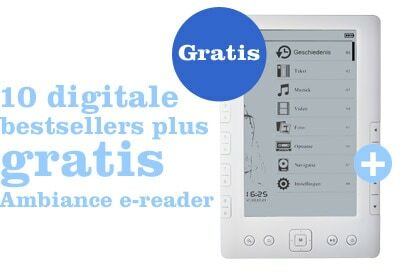 Earlier this year, another Dutch chain of booksellers (AKO) started selling a reader made by Ambiance (the Digibook). That was a huge failure: many hardware defects, and inferior firmware that never was updated, in spite of ‘solid’ promises. That reader was quickly and quietly taken from the market. Did Ambiance learn from this experience, or did Bol.com fall into the same trap as AKO? But when you try to order that bundle from that page, the price in your shopping cart is not EUR 99 but EUR 170. As to DRM support: you raise a point there. On the one hand one might think you can safely assume it does support Adobe DRM, as otherwise you could not read those 10 books (all e-books sold by bol.com have Adobe DRM). On the other hand, this was one of the problems with the Ambiance reader that AKO sold earlier this year (also with a bundle of Adobe DRM protected books). The reader did not support DRM! However, they promised a firmware update inclusing DRM support – even mentioned a date – but this update never came.